31.11 HISTORICAL PACT: Historically the signing of the Nazi-Soviet Pact triggered the countdown to war, as with it Germany eliminated the possibility of a two-front war. This diplomatic coup came at a significant cost, however, as Stalin moved the Russian border westward and strengthened his military position. In Gathering Storm, the timing and nature of the Nazi-Soviet Pact, and even its existence, will vary from game to game. A. GERMAN AGGRESSION AGAINST POLAND: After Germany announces aggression against Poland, including Danzig and the Corridor, and before the resulting crisis is resolved. B. AFTER THE OUTBREAK OF WAR: After war breaks out between two or more Axis and Allied major powers, before the game ends. 31.22 PACT OFFER NOT COMPULSORY: Germany is not compelled to enter into negotiations for the Nazi-Soviet Pact. 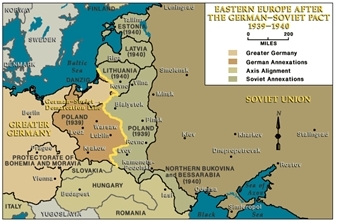 31.23 RUSSIAN REFUSAL PROHIBITED: If Germany offers to negotiate the Nazi-Soviet Pact, Russia may not refuse. 31.31 Once Germany announces its intention to conclude the Nazi-Soviet Pact, the Russian player acquires territorial concessions from Germany (the Russian “concession level”) as set out below. The value of the territorial concessions obtained by Russia is equivalent to the A World at War BRP value of the territories. Explanation: The Nazi-Soviet Pact Concession Table sets out the value of territorial concessions made by Germany to induce Russia to sign the Nazi-Soviet Pact. The Basic Russian concession level is 30 points, of which the first 10 points must be eastern Poland. Russia decides what territories to take, subject to the restrictions in 31.42. A. SUPPORT LEVELS: The Russian support level and the German support level (10). If the net support level favors Germany, this strengthens the German bargaining position and reduces the Pact concession level. If the net support level favors Russia, this weakens the German bargaining position and increases the Pact concession level. B. EUROPEAN AGGRESSION INDEX: The EAI (23.31E). The higher the EAI, the greater the Pact concession level. If the Pact is negotiated as a result of aggression against Poland (31.21A), the EAI for German aggression against Poland is not counted (23.21A). The EAI is considered to be +5 if the Pact is negotiated after the outbreak of war (23.26, 31.21B). Finland, Rumania and Turkey: -1 for one or two Axis flags, -2 for an Axis trade pact; +1 for one or two Russian flags, +2 for a Russian trade pact; Allied flags are ignored. E. POLISH RESISTANCE: Poland’s resistance level, as augmented by a tile draw. The higher Poland’s resistance level, the more Germany wants Russia’s assistance, so the greater the Pact concession level. If the Nazi-Soviet Pact is negotiated as part of a crisis over Poland, including Danzig and the Polish Corridor, the tile draw for Polish resistance is made during the resolution of the crisis. The resistance level for all of Poland is used, unless the Pact is negotiated as part of a crisis over Danzig and the Polish Corridor. -5 if Italy is at war. +5 if Britain is at war. +5 if France is at war. The calculation of the Nazi-Soviet Pact concession level is similar to that for a Russian declaration of war on Germany (32.7). Instead of declaring war in support of a bordering minor country, Russia is bought off with concessions. 31.33 ROUNDING: The Nazi-Soviet Pact concession level is rounded to the nearest number divisible by five. This affects the level of Germany’s economic interest in Russia in A World at War, but has no effect in Gathering Storm. 31.41 The secret protocols to the Nazi-Soviet Pact, the existence of which were denied by the Soviet Union for many years, partitioned eastern Europe between Nazi Germany and Soviet Russia. A. The first Russian territorial concession must consist of eastern Poland (10 points). B. The next three Russian territorial concession must consist of some or all of the Baltic States (Estonia, Latvia and Lithuania, in that order: 5 points each, for a total of 15 points). C. Any additional Russian territorial concessions must consist of territory adjacent to Russia or a territory already taken as a Nazi-Soviet Pact concession. D. If the Pact is negotiated as a result of German aggression against Danzig and the Corridor or against Poland proper, Russia must take eastern Poland as a territorial concession, but otherwise may not take as a territorial concession an area which is the subject of German aggression. If the German aggression was against Poland proper, Russia is restricted to eastern Poland; if the German aggression was only against Danzig and the Corridor, then Russia could, if the concession level was high enough, take central Poland as a territorial concession. A. GERMAN AGGRESSION:Russia does not oppose the German aggression against Poland. B. EAI: The European Aggression Index is increased by +1 each turn. C. RUSSIAN SUPPORT: Russia’s support level is increased by +1 each turn for the remainder of the game, in addition to the +2 Russian support increase for Poland. D. ANTI-COMINTERN COUNTER: Germany may not use the anti-Comintern counter (24.38). E. RUSSIAN PURGE LEVEL: Russia’s purge level increases by the Pact concession level divided by 5 (31.32), to represent the consolidation of power resulting from Stalin’s far sighted diplomacy (22.31D). F. RUSSIAN CIVILIAN FACTORY MOBILIZATIONS: Russia may not mobilize its civilian factories, even if it is at full cohesion (14.43C). G. BRITISH AND FRENCH SUPPORT LEVELS: The British and French support levels are increased by +1 for the remainder of the game, starting in the turn after the signing of the Pact (10.71E, 10.81E). 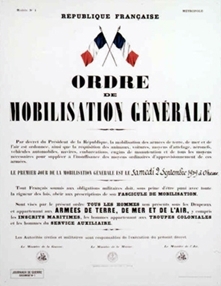 H. BRITISH AND FRENCH RANDOM EVENTS: Britain and France draw additional random events, starting in the turn after the signing of the Pact (9.15). I. RUSSIAN AND ALLIED FLAGS: Russian and Allied flags may no longer co-exist and are immediately eliminated on a 1:1 basis in each diplomatic target containing both Russian and Allied flags (24.82B). J. VICTORY POINTS: The Nazi-Soviet Pact affects the victory points awarded to Germany and Russia. A. NO NAZI-SOVIET PACT: The Nazi-Soviet Pact may not be negotiated in a subsequent turn. B. RUSSIAN SUPPORT INCREASES: The Russian support level is increased by +1 for the remainder of the game. Danzig and the Corridor: 1 purge event. Poland: 7 purge events (including the purge event for Danzig and the Corridor). D. RUSSIAN MOBILIZATIONS OF CIVILIAN FACTORIES: Russia may convert its five civilian factories to military use (14.43C). E. DECLARATION OF WAR IN SUPPORT OF POLAND: Russia may declare war on Germany in support of Poland if permitted to do so by 32.7. 31.71 PACT MAY NOT BE RENEGOTIATED: If war does not break out in the turn in which the Nazi-Soviet Pact is signed, the Pact remains in effect and may not be renegotiated. 31.81 POLAND AS A GERMAN SATELLITE: The only way in which Germany may break the Nazi-Soviet Pact is by making Poland a German satellite (29.22). Otherwise Germany is bound by the Nazi-Soviet Pact for the remainder of the game. 31.82 BREAKING THE PACT IN THE TURN IT IS SIGNED: If Germany breaks the Nazi-Soviet Pact in the turn in which it is signed, the Nazi-Soviet Pact is considered never to have been signed and the effects set out in 31.51 do not apply. A. The effects set out in 31.51 no longer apply, with the exception of 31.51B (the +1 EAI increase is permanent). Germany may again use the anti-Comintern counter (24.3) and Russian and Allied flags may again co-exist (24.82B). B. Effects which occurred while the Nazi-Soviet Pact was in effect are not reversed (the additional Allied random events (31.51H) are valid; Allied and Russian flags remain eliminated (31.51I); and so on). C. If the increase in the Russian purge level from the German aggression against the remainder of Poland is greater than the increase in the Russian purge level from the Nazi-Soviet Pact (31.51E), the Russian purge level is increased by the difference; otherwise the Russian purge level remains unchanged, with Russia retaining the purge level increases from the Nazi-Soviet Pact. D. The provisions of 31.6 apply retroactively to the start of the crisis phase in which Germany establishes Poland as a satellite and Russia may, if otherwise able to do so, declare war on Germany in support of Poland (31.61E). 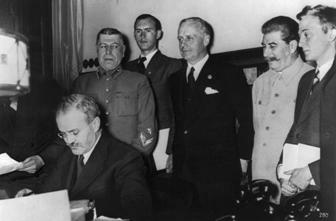 31.84 RUSSIA: Russia may not break the Nazi-Soviet pact. A. NO NAZI-SOVIET PACT: No Nazi-Soviet Pact may be negotiated if Germany subsequently commits aggression against Poland. B. RUSSIAN SUPPORT INCREASES: Russia’s support level is increased by +1 each turn for the remainder of the game (10.91B). E. DECLARATION OF WAR IN SUPPORT OF THE BALTIC STATES: Russia may declare war on Germany in support of the Baltics States if permitted to do so by 32.7.